They are entirely black with long hair that sticks out around their heads. Their head and body length is 8-9 inches, while their tail length is 10-13 inches. they weigh 14-19 ounces. Goeldi’s have claws instead of flattened nails on their fingers, a trait they share with tamarins. 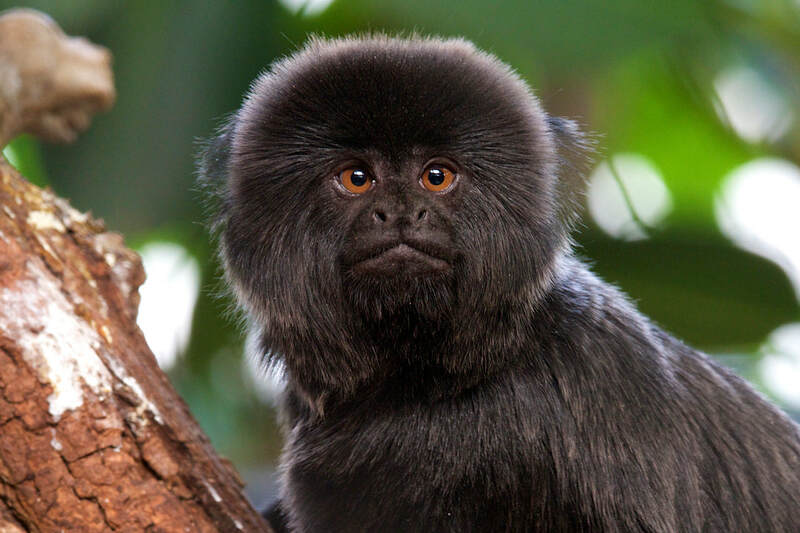 Also, Goeldi’s are the only small new world monkeys with 36 teeth; all other marmosets and tamarins have 32. Goeldi’s monkeys are a zoological puzzle. They are small and look like tamarins and, like them, have claws rather than nails on the fingers. But Goeldi’s teeth and skull shape are more like the bigger New World primates, such as capuchins. It is now thought that Goeldi’s belong in a separate group of primates, distantly related to both tamarins and capuchins. Mixed deciduous forest, with discontinuous canopy including a well-developed shrub layer. They may often be found in swampy areas near rivers and streams. 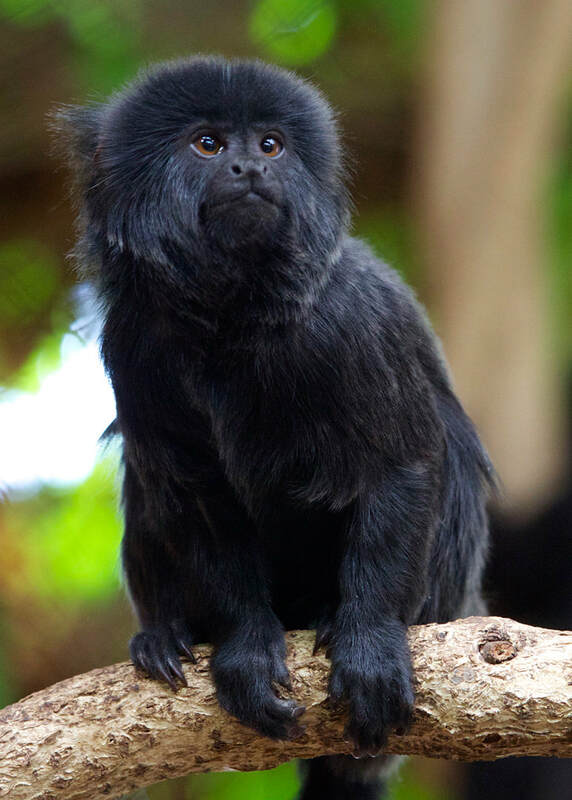 Goeldi’s monkeys are distributed through the upper Amazonian rain forest of South America, including eastern Equator, eastern Peru, western Brazil and northern Bolivia. In the wild, they eat insects, small vertebrates, fruit, tree gum, sap and nectar. About 10 years in captivity. Infants are cared for solely by the mother for the first 10-20 days of life, then the group members share in the carrying. Average group size is six members with group bonds being very strong. Members remain within 50 feet of each other and maintain contact by a shrill call. ​You can see these energetic monkeys in our Rainforest exhibit, where they are sharing space with the Agouti.